Often at times I'm wanting a home cooked meal (too often in this pregnancy I've been ordering in Thai food for my fam), but don't have the energy I used to for slaving in the kitchen (one of my favorite passtimes;)). Fried rice makes a superperfect centerpiece to our family dinners on nights like those and it's made even easier with goodies from my CSA box and leftover brown rice. One night last week I threw together a fiddlehead fried rice along with some kabocha squash and Field Roast sausage. Everything was easy and quick and made for a filling, delicious summer dinner. It was our first taste of fiddleheads and they were crispy and yummy and going to be a new addition to our early summer table for sure! 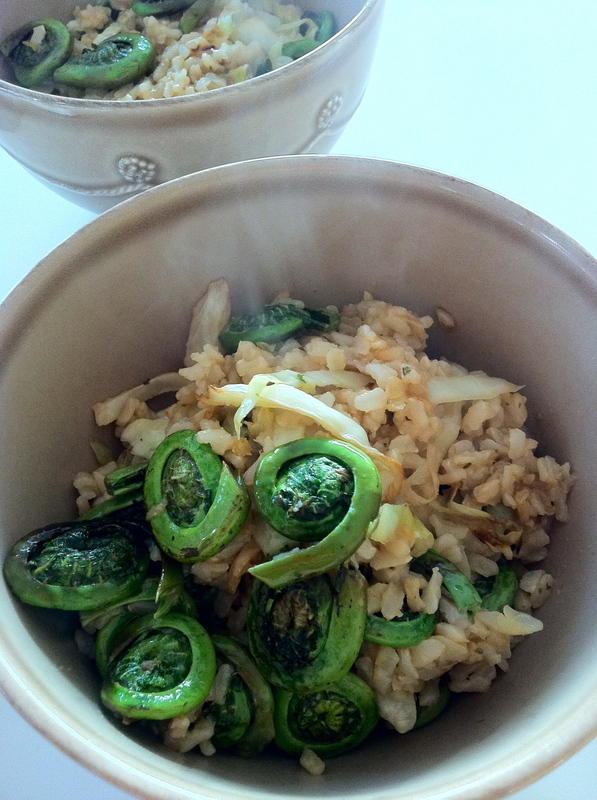 In a large saute pan heat up the olive oil and saute the fiddle heads for 2-3 minutes to get them started cooking. Add the cabbage and cook together until the cabbage is soft, about 5-10 minutes. Add the rice to the pan along with the earth balance and the shoyu. Mix and cook through until the rice is hot (at least 5 minutes).